The mobile VoIP market is crowded, so you definitely need something unique to stand out from the crowd and Swiss startup Voxtrot could well have hit on a great idea – free calls without having to launch an app. 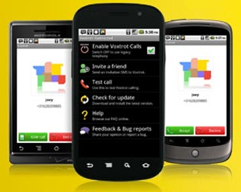 Unlike rivals services such as Truphone and Viber, Voxtrot sits on top of your phone’s native phone app. When you call someone who isn’t a Voxtrot member, it’s routed normally. However, if you call a fellow user, it’s sent by VoIP and is free. Currently in beta and available only for Android, it really is the simplest, most transparent VoIP system I’ve used. Aside from the icon sitting in the notification bar, you don’t really notice that it’s running. You can just get on with using your phone. It uses your existing address book so there’s no need to access the app except to adjust your preferences or invite friends to the service. In fact, I only really noticed that I was using Voxtrot when I made a call. Like many VoIP services, the sound quality can be a ‘thinner’ than a standard call. It’s worth noting that whether the call really is free or not depends on your data connection. While Voxtrot doesn’t charge, your mobile carrier almost certainly will charge you for the data connection, meaning that wi-fi will be the best option for many users. However, if you’re not connected to any form of data, your call will be routed via your mobile operator. Voxtrot was founded by Taavet Hinrikus, part of the original Skype team, and the company’s financial backers include Skype Chairman and CEO Michael van Swaaij. As such, this is a VoIP service from people with serious VoIP experience and it’s well worth keeping a serious eye on. In the future Voxtrot plans to calls to landline numbers over VoIP at a price and support for other mobile platforms beyond Android is in the pipeline.